bio: knives isn't human, he is what's know as a "plant", not a tree/vegtable plant, a plant is a power source created by humans to provide power to space ships and towns, they are also know as "the beings outside of time", this is why knives doesn't look 130 years old, usually plants are created inside big lightbulb containers but knives and his twin brother vash (the good/main character of the series) were "born", if you will, outside the bulbs, on a space ship, so they look more human, when he was young he was treated badly by one of ships crew members, so knives decided to get his revenge, by slowly killing the other crew members, without hesatation. once the captian had been killed, he reset the ships course to crash into the planet "gun smoke" him and vash were the only survivers of that ship, however a woman named rem saved the other ships. 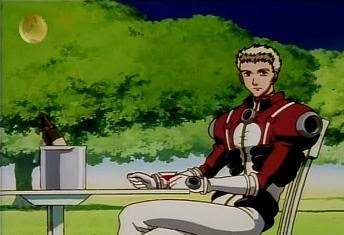 once down on the planet, knives set out with vash to find and kill all the other humans, vash just wanted compony. after 30 years knives creates his weapon of choise, a black .45 calabour handgun that helps to turn his arm into an "angel arm"
the angel arm is capable of destroying entire cities and it has, TWICE!, knives gives a silver handgun to vash, which he tricks vash, to wipe out a city. along with destroying 2 cities and a spaceship full of people, knives also kills the entire poputlation of 5 other cities.